Michael “Heckuva-job” Brownie has been making headlines the past couple days with his “expert” assessment that President Obama may have jumped the gun with his pre-emptive warnings about Hurricane Sandy. We’ll never know how many lives were saved because officials across the Eastern seaboard sounded the alarm early and got people out of harm’s way. But I’m gonna guess that a Romney campaign that has gone to great lengths to keep any memory of the Bush administration in a dim corridor far from voters’ consciousness is not pleased with Brown’s uninvited intrusion into the political discourse in the final days of a close election. Michael Brown is best known as the hapless FEMA director that George W. Bush made famous when he commended the guy for doing a “heckuva job” during Katrina as the Lower Ninth Ward sank on national television. His re-emergence during Sandy would be laughable, except for one thing: it reminds us that the outrage we experience in moments of tragedy are too often nowhere to be found in the cold calculations that lead to election messaging. In 2005, for a moment in time, a stunned nation peered at itself in the mirror after Hurricane Katrina. We began to have an honest conversation about the intersection of poverty, racism and callousness that allowed an entire population to languish in misery while a president flew over in his plane and claimed to understand their plight. While the legacy of Katrina played a role in diminishing confidence in Bush’s leadership, the 2008 election was litigated more over the plight of Iraqis and not over how to prevent another Katrina. Similarly, in 2011, Troy Davis was put to death for a murder that it seems dubious at best that he committed. Amidst nationwide vigils and protests about the racial inequity of the US criminal justice system, the Supreme Court denied the last appeal from Davis and his lawyers to stay the execution. He was killed by lethal injection on Wednesday, September 21. “I Am Troy Davis” became the anguished rallying cry of a public paralyzed by injustice. And for months early this year, the murder of Trayvon Martin catalyzed a national conversation about American’s obscene gun laws and the tolerance we have for the epidemic of murder of young black men. Hoodies, skittles and iced tea became the macabre symbols for a life that was lost way too early. While vigilantes like George Zimmerman remain free, gun control has meritted only the slightest mention in the presidential race, despite the best efforts of groups like Mayors Against Illegal Guns. On his show last Sunday, Chris Hayes did a must-watch riff on what the election would be like if the South Bronx was the “swing state” upon which the election hinged. Instead of an auto bailout, we might be having a national conversation about homelessness, or stop-and-frisk or racial disparities in our prison system. Instead, these critical issues are relegated to the sidelines in our nation’s most watched election spectacle because hard political calculation demands a more expedient route to winning a majority in the Electoral College. Given the importance of Ohio in winning the 2012 contest, we’ve spent far more time in these final weeks understanding the fine points of a relatively modest—albeit important—government investment in a key part of our manufacturing base than on the life-and-death issues that affect millions of people in this country. Along with long-standing groups like League of Young Voters and Color of Change, a new loose-knit group of courageous and committed activists has decided that this is the year to take action. Threading the pragmatic task of building visible political power with the passion of pursuing a deeply moral cause, Hoodie Vote was formed a few months ago to give young people of color an organizing structure that allows them to participate in the election while showing their allegiance to correcting racial inequity in our culture. I wanted to start the Hoodie Vote movement because I saw a huge need for young people—particularly young people of color—to be involved in the political process. I saw the correlation between young people and fashion/culture and the need make a difference in what they viewed as a “real” way. I also was very touched by what happened to Trayvon Martin so much so that I got in a van full of strangers for a twenty-one-hour ride to Sanford, Florida, to be a part of the march because the cause was one that I believed deeply in. I swore that I would not let Trayvon be forgotten. The thing about the situation with Trayvon, the hoodies, this movement and the political process is that people voted on the “stand your ground” law that ultimately ended in the death of an innocent young man, and if we forfeit our right to vote who’s to say that there won’t be another Trayvon? I wanted young people to make that correlation. I wanted them to know that it is much bigger than a presidential seat, there are issues that affect you locally in a real way. So why not send a message on this election day in our hoodies? Why not show people that we matter, that we care, that we are involved. We aren’t robbing, killing or looking suspicious in our hoodies. We are making a difference, changing the world in our hoodies! I see this as a way to continue to turn tragedy into triumph and to bring more positive out of such a negative situation. Hoodie Vote has taken off, with groups on fifty campuses around the country and a handful of celebrity endorsements. 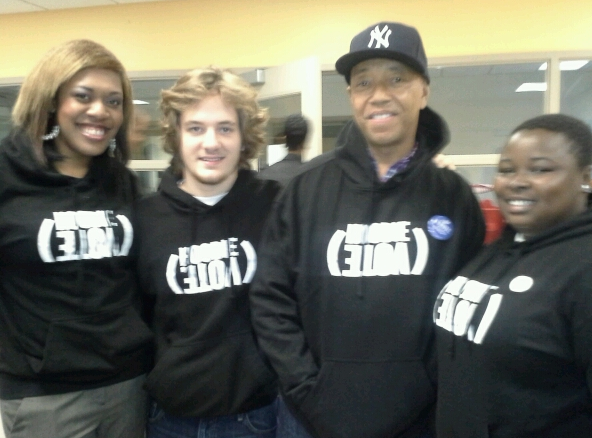 Even Russell Simmons has gotten in his hoodie to support the emerging movement. These committed activists are playing the long game. We’ve got miles to travel before we see national leadership embrace the embedded racism and poverty that plagues our inner cities. But as Hoodie Vote’s Trell noted to me in his comments, “We will not be bitter because of this, we will be better!” We would all do well to learn from this spirit.